In this fast paced, eye-opening seminar, Ed Foreman recommends a series of easy to implement strategies for overcoming the daily bombardment of negativity surrounding us. You’ll learn the basic habit patterns of winners, techniques for overcoming worry, how to help others be more positive, and dozens of ideas to make sure that every day is a terrific day. When it comes to motivating and teaching people how to have a consistent, positive mental attitude, Ed Foreman is one of America’s best! Serving corporate America for more than 40 years, Ed has been a full time management consultant and professional speaker in high demand. 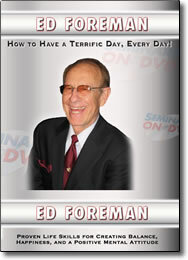 Ed Foreman regularly addresses corporations and associations across America conducting his highly acclaimed motivational and sales training seminars. In addition, he has been positively featured on CBS 60 Minutes and is a recipient of the coveted CPAE award for speaking excellence.